Georgia is one of the United States’ closest non-NATO partners among the post-Soviet states. With a history of strong economic aid and security cooperation, the United States has deepened its strategic partnership with Georgia since Russia’s 2008 invasion of Georgia and 2014 invasion of Ukraine. U.S. policy expressly supports Georgia’s sovereignty and territorial integrity within its internationally recognized borders, and Georgia is a leading recipient of U.S. aid in Europe and Eurasia. Many observers consider Georgia to be one of the most democratic states in the post-Soviet region, even as the country faces ongoing governance challenges. The center-left Georgian Dream party has more than a three-fourths supermajority in parliament, allowing it to rule with only limited checks and balances. Although Georgia faces high rates of poverty and underemployment, its economy in 2017 appeared to enter a period of stronger growth than the previous four years. 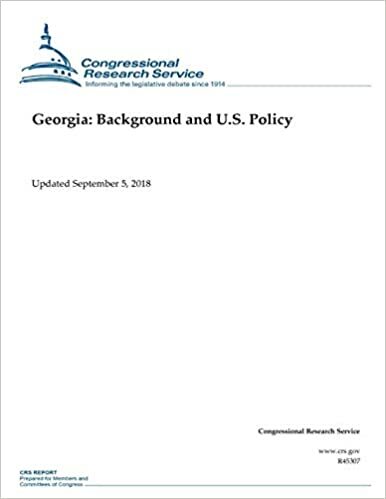 Georgia: Basic Facts Population: 3.73 million (2018 est.) Comparative Area: slightly larger than West Virginia Capital: Tbilisi Ethnic Composition: 87% Georgian, 6% Azerbaijani, 5% Armenian (2014 census) Religion: 83% Georgian Orthodox, 11% Muslim, 3% Armenian Apostolic (2014 census) GDP/GDP per capita: $15.1 billion/$4,099 (2017 est.) Top Exports: copper ores, beverages, iron and steel, motor vehicles, pharmaceuticals (2017) Leadership: Prime Minister Mamuka Bakhtadze, President Giorgi Margvelashvili, Defense Minister Levan Izoria, Foreign Minister David Zalkaliani, Parliamentary Chairman Irakli Kobakhidze Sources: National Statistics Office of Georgia and International Monetary Fund (does not include Abkhazia and South Ossetia). The Georgian Dream won elections in 2012 amid growing dissatisfaction with the former ruling party, Mikheil Saakashvili’s center-right United National Movement, which came to power as a result of Georgia’s 2003 Rose Revolution. In August 2008, Russia went to war with Georgia to prevent Saakashvili’s government from reestablishing control over Georgia’s regions of South Ossetia and Abkhazia, which broke away from Georgia in the early 1990s to become informal Russian protectorates. Congress has expressed firm support for Georgia’s sovereignty and territorial integrity. The Countering Russian Influence in Europe and Eurasia Act of 2017 (P.L. 115-44, Title II, §253) states that the United States “does not recognize territorial changes effected by force, including the illegal invasions and occupations” of Abkhazia, South Ossetia, and other territories occupied by Russia. In September 2016, the House of Representatives passed H.Res. 660, which condemns Russia’s military intervention and occupation of Abkhazia and South Ossetia. Similar resolutions on Georgia and other countries with territories under Russian occupation have been introduced recently in the House and the Senate (H.Res. 955, H.Res. 1030, S.Res. 106).